In the Outer Banks Sport Fishing is a way of life. 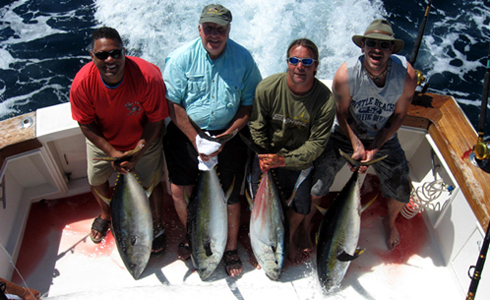 The outerbanks and Cape Hatteras offer unbelievable fishing in very close proximity to land. The run to the Gulf Stream is short, and Fishing the Outer Banks of NC can be nothing less than spectacular. 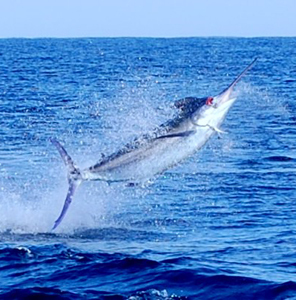 Yellowfin Tuna, Bluefin Tuna, Dolphin, Wahoo, Blue Marlin, White Marlin, and Sailfish all await you on your Spring Time Outer Banks Fishing Charter. Pictured right is LOW PROFILE, a 55' Custom Built North Carolina Sportfish. This boat was built to fish the Outer Banks of North Carolina. 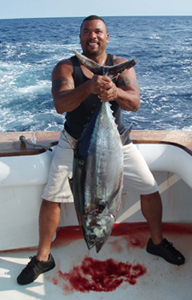 Winter Bluefin Tuna, Springtime Yellowfin Tuna, Dolphin, Wahoo, and great Billfishing action in the Summer. The Outbanks of NC truly offers some of the best Big Game Sportfishing in the Country, and the fishery is truly year round. LOW PROFILE is setup with twin Caterpillar diesel engines,a fully air conditioned salon, top notch Penn Tackle and is rigged for battle. She iis fast, clean and has a huge cockpit with a custom Release Fighting Chair, for those oversized Tuna we catch here regularly. It's looking like it's going to be another great Bluefin season here on the Outer Banks, so give us a ring if you'd like to catch that fish of a lifetime. Captain Darrin Callahan holds a 100 ton license and has been fishing the waters off the Outer Banks his entire life. With a love for the sport, a great personality, and world-wide fishing experience, you are in good hands when you board the Low Profile for a day of Fishing the Outer Banks. Big Eye & Bluefin Tuna Charters - Fall is the best time to target the Big Eye tuna out of on the Outer Banks and Winter is the time for BIG Bluefin Tuna. Fishing for the Big Eye and Bluefin can be about as exciting as it gets and this is definitely the place to do it! Get more NC Fishing info by following us here! OUTER BANKS OPEN BOAT MAKE UP TRIPS $350 PER PERSON! Giant Bluefin! - We almost always have one or two boats, incuding the JUSTIFIED and LOW PROFILE, which are running Giant Bluefin Fishing Trips in the Outer Banks, or wherever the Bluefin are biting! 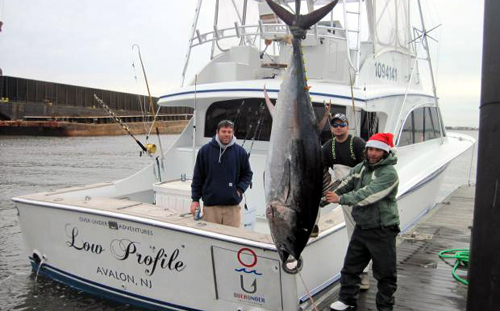 Giant Bluefin Charters!